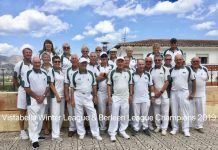 Wed the Earls played Quesada Tigers at home and had a very good 10- 4 win with an aggregate of 100-88 and the winners were C Parsons 21-7, A Brown F King 24-8, J Redfern B Doran B Allen 20-14, J Jarvis B Eldred E Shepherd, J Mullarkey 17-15. 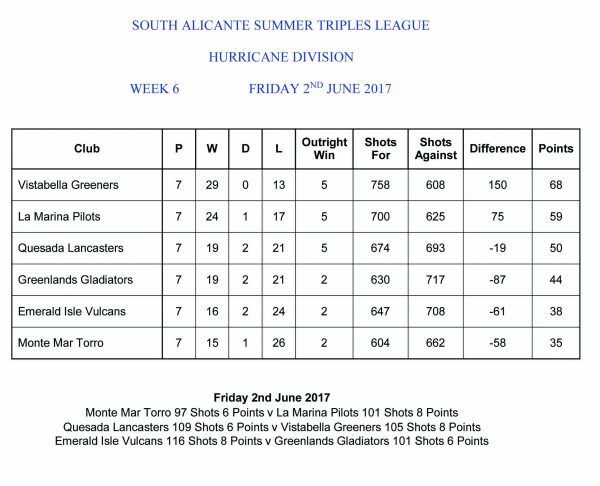 Results from the South Alicante Hurricane Division, Greenlands Gladiators were away to Emerald Isle Vulcans. Final score was – Total shots for – 101. Against – 116. Points for – 6 against – 8. Winning rinks were – Janet Bliss, Margaret Dewar, skip Dave Dudding. – 18 shots to 17. Sheila Stead, Dave Giddings, skip Jim Oliver. 21 shots to 16. Jean Thompson, Janet Webb, skip Dave Thompson. 21 shots to 16. 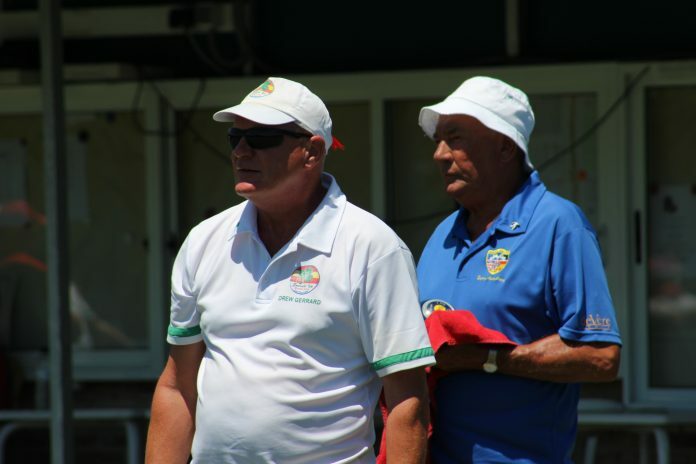 Greenlands Bowls Club are seeking new members to add to their Summer and Winter league teams. All new members will have an equal opportunity to play whether they be new or experienced bowlers. Interested?? Then please contact Haley on 966844399. 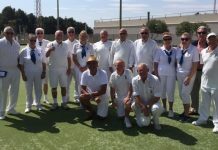 A very competitive and enjoyable match against our near neighbours La Marina Pilots. The teams shared the rinks with both teams winning on three rinks with the Pilots winning on shots. Shots Torros 97 – 101 Pilots. Points Torros 6 – 8 Pilots. Well done to our winning rinks, Sue Bounds, Joan Harding and skip Graham Smyth. Keith Simpson, Leslie Jones and skip Dave Melville. Harry Dobson, Mike Farrelly and skip Bill Young. San Miguel Moors played San Miguel Christians winning 11 points to 3. 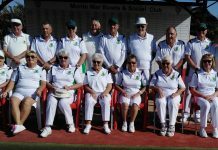 Moors winners were Eileen Potts, Peter Ross, Ros Stockell 21-14; William Holden, Joe Getgood, Alan Dobie 21-12; Bill Moseley, Barbara Scotthern, Eddie Cowan 21-12; David Champion, Frank Scotthern, Jack Jackson 16-11; Cliff & Linda Plaisted, Bob Donnelly drew 19 all against Ken Hope, Brian Allen, Reg Cooper. 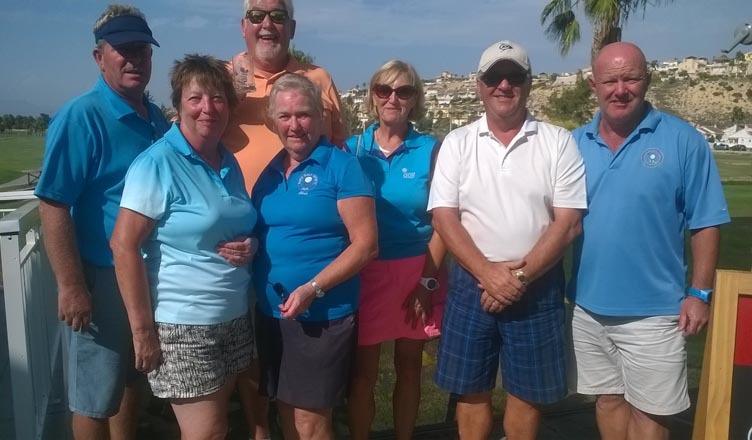 Winners for the Christians were Anita Brown, Alan Campbell, John Marshall 24-12. Shots for the Moors 110, the Christians 92. In the VCL the Deputies had a bye, No results received for the Sheriffs. 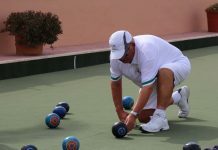 Club mornings still ongoing, Sundays, Tuesdays, Thursdays 0945 for 1015, WASPS on Wednesdays afternoons, come along for 1.30pm, €5 for an afternoons bowling, use of shoes and woods, and free tuition if required. 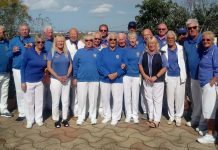 For further details on San Miguel Bowls Club, please contact the President, Ros Stockell, telephone 965329778 or Secretary, Pat McEwan, telephone 966714257. Here we go then last month of the Summer Leagues. Everything to play for, the Pilots to win their league and in the VCL, La Marina not to get relegated. Best of luck to both. 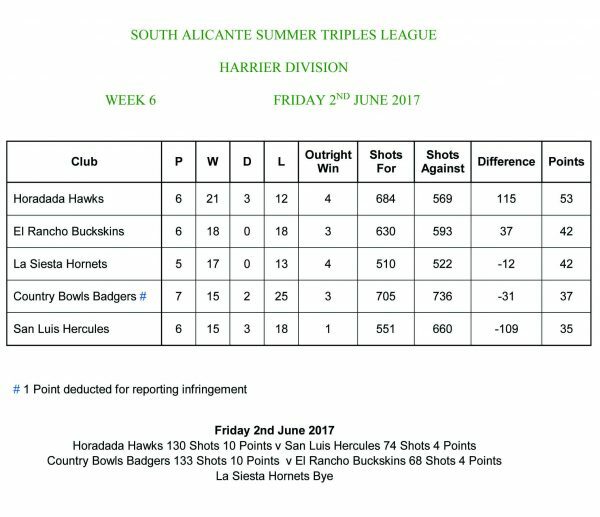 We did alright in the VCL getting six points off a very strong San Luis Falcons side remembering they won the league last year. Three wins each but the Falcons got the overall shots for the extra two points. 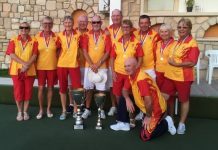 Our winners were in the Ladies Singles with Janet Parsons winning 21-6, in the rinks Dave O’Sullivan, Garth Slater, Tom Spencer and Dave Hadaway had a 18-11 win and very excitingly Barbara Forshaw, Mike Smith, Jean Perchard and Terry Perchard won on the very last end by three. Looking at the score sheet it could have been so easily 12-2 to the Pilots as two of our rinks only lost by one shot. Instead we beat Monte Mar Torre 8-6 away from home. So well done to all to keep us up towards the top. Jean Tregoing, Rob and Margaret Finlayson won21-16 with Garth Slater, Carol Smith and Dave Taylor getting two more points winning 21 -14. While Barbara Forshaw, Mike Smith and Tom Spencer came up trumps with a 17-14 win. Usually at this time of the year folk are thinking about moving clubs or people are about to move out here for a better life in Spain. 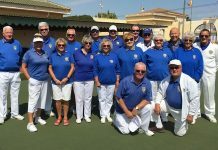 If you are one of those people why not come and join us at La Marina, friendly, happy club with a good social life out of bowls. Great for new bowlers as we provide coaching. If you are interested give our Captain Steve Hindle a call on 966184360.
we have to congratulate Martin Foulcer who was defending his title in the Spanish Nationals Men’s Singles, he did exceptionally well and reached the semi-final only to be defeated by Brian Robertson (Mazarron) who went on to win the 2017 title. 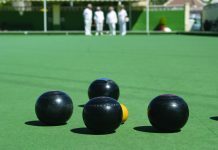 Back to league bowls this week, kicking off with a VCL derby between our Saxons and the Vikings the Saxons being the home team. 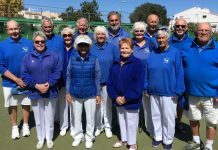 First result to come in was the Ladies Singles with Lin Watkins (S) 21-14 (V) Sandra Burrows. Men’s Singles Ian Kenyon (S) 13-21 (V) Martin Foulcer. Pairs, Del Gunning & Peter Whitehall (S) 25-12 (V) Pauline & Pat Rafferty. Triples, Beryl Regan, Brian Pointon & Mike Regan (S) 16-16 (V) Neil Burrows, Stuart Allman & Brian Dunn. Rinks, Mike Irwin, Sheila Whitehall, Jeff Neve & Barry Norris (S) 10-23 (V) Jenny Chaplin, Andy Leggatt, Dave Chaplin & Eric Bishop. Rinks, Ron Smith, Charlie Watkins, Les Barber & Dave Jenkins (S) 15-16 (V) Frank Barclay, Barbara Brown, Bert Ewart & Arthur Brown. The shots were very close, Saxons 100 (5) – 102 (9) Vikings. SAL League. 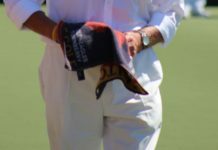 The Fairways at home v San Luis Wellingtons, they had three teams taking full points and a drawn game, E Blythe, C Watkins & B Pain 31-11. M Foulcer, B Brown & M Furness 19-8. L Bishop, J Bowman & I Kenyon 21-12 and G Paylor, A Brown & K Cuthbert 14-14. 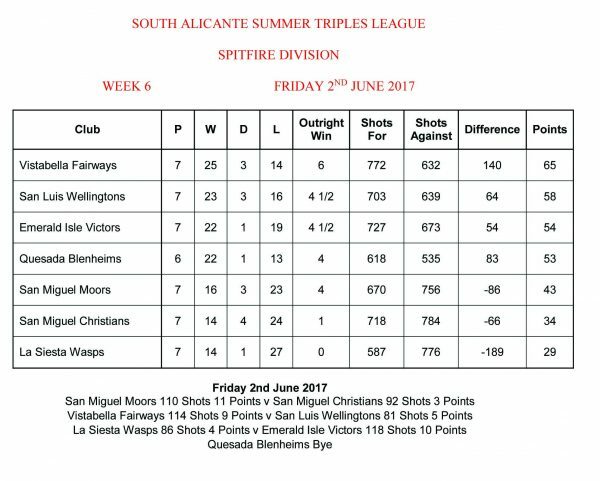 Shots, VB 114(9) – 85(5) SL. The Greeners v Quesada Lancasters had a good away result, winning on four rinks but just missed out on the long game! S Cox, S Whitehall & L Barber 21-6. M Irwin, S Norris & P Rafferty 25-14. R Smith B Pointon & B Corbishly 25-15. D Gunning, D Chaplin & D Jenkins 20-18. Shots, VB 105(8) – 109(6) Q. Both teams are doing exceptionally well in the league, keep up the good work. 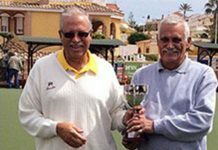 Javea Green Bowls Club Championship Presentation Dinner.